Harnessing the power of wind energy instead of burning fossil fuels is one essential part in the battle of reducing green house gas emissions. Whilst climate change is the single greatest long-term threat that faces our wildlife, the immediate impact that windfarms have on bird populations can be dramatic. The wind turbines’ enormous blades kill thousands of birds in the US each year, knocking them out of the skies mid-flight. Besides this, wildlife populations can also suffer from habitat loss and fragmentation due to development. New research has identified areas that would safeguard one potentially affected wide-ranging bird – the golden eagle, whilst providing great yields in wind energy. “Some poorly sited wind farms have caused major bird casualties, particularly at Tarifa and Navarra in Spain, and the Altamont Pass in California. At these sites, planners failed to consider adequately the likely impact of putting hundreds, or even thousands, of turbines in areas that are important for birds of prey.” states the Royal Society for the Protection of Birds. The new study, from The University of Waterloo, is trying to take a preemptive approach to this problem. Researchers investigated the areas in which golden eagles are nesting, and included other information like prey availability, land use and habitat quality. They then recorded which areas would simultaneously be good sources for wind power. 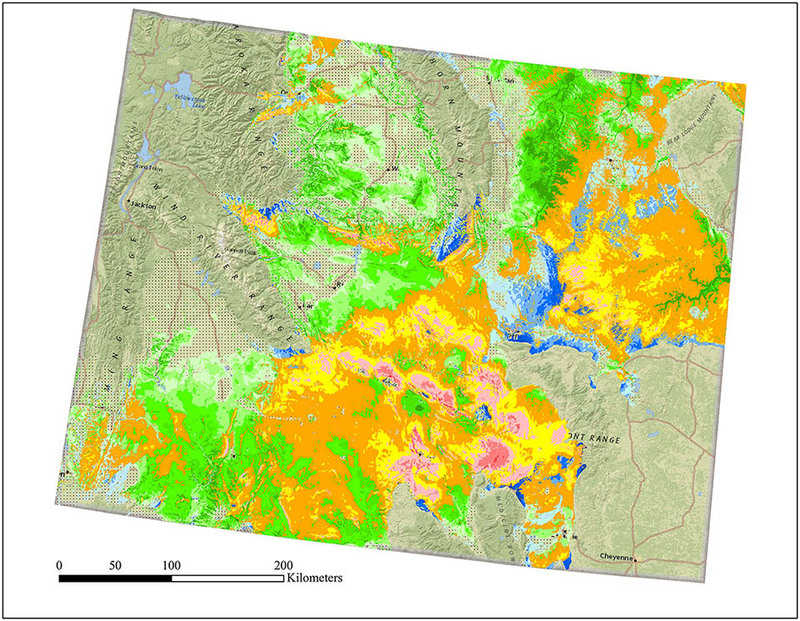 Putting all of these areas together yielded a map for the area in Wyoming, which has the second highest golden eagle population in the United States. The map highlights the best places for wind farm development, whilst conserving the Federally protected eagles (highlighted in blue). The green areas show the best places for golden eagle nests, and thankfully – no wind farms are situated within these. However, the orange and yellow areas highlights ‘moderate risk’ sites that have less than ideal winds, but plenty of golden eagles – and there are many turbines located in these areas. See the full map and key in the open access paper. In general for the golden eagles in Wyoming, this study found positive indications as the results suggest that wind potential and the relative probability of golden eagle nesting are not necessarily spatially correlated. The authors maintain that this sort of study is no replacement for on-the-ground surveys of potential development sites, but they hope that this predictive mapping will help with initial assessments. Increasing the extraction of energy from renewable sources will reduce carbon emissions and potentially slow global climate change, in turn protecting the future of wildlife populations and the landscapes in which they live. The fights for cleaner energy and for the immediate protection of wildlife come from the same place – wanting to preserve our natural environment and what it contributes to our economy as well as our well-being. This is therefore just one example of research being conducted in order to find a happier medium between harnessing renewable energy for the near future, and safeguarding our wildlife today. Previous ArticleIf you build it, they will grow – are frogs flourishing in human-made ponds? How Eco-Friendly is “Green” Energy? A brighter future for coral reefs?